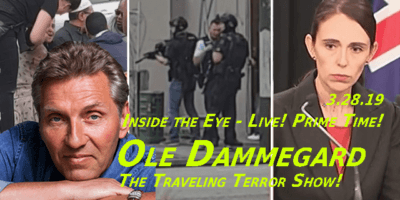 Greg Felton – The Host and the Parasite – ITEL PT – 6.28.18 | Inside the Eye - Live! Greg Felton, author of the book “The Host and the Parasite“, a work that details how “the Lobby”, Christian Evangelicals, and the Neocons rose to power beginning in the 1980’s.Â Unfortunately, Greg’s mic was muffled, which made for some frustrating listening moments and his insistence on using “political correct” forms of cultural Marxist speech when speaking about Jewish influence in the United States and the West at large proved to be impediments to focusing purely on Greg’s work. 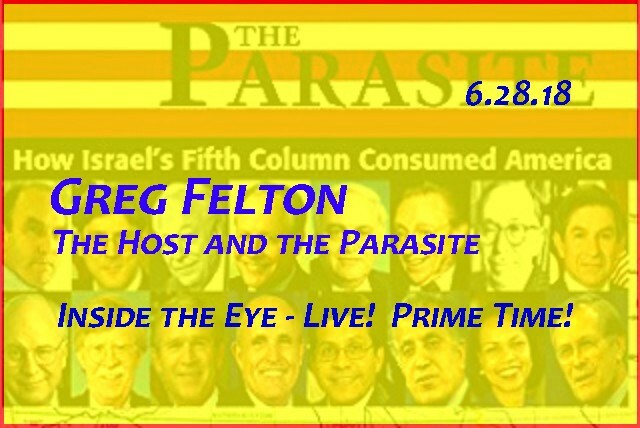 The Host and the Parasite was a work begun shortly after 9-11, 9-11 being an event illuminated the reality that America is controlled by a hostile, foreign force.Â In this interview, Greg seemed to put forward the idea that “only the Zionists” are the problem, then later conceded that you don’t get into positions of influence in the Jewish community if you are not first and foremost, a “Zionist”. Essentially, the conversation reverted to the 2005 era when “is it Jews or Zionists or Jesuits or Freemasons” era of speaking about the systemic problems with Western institutions. 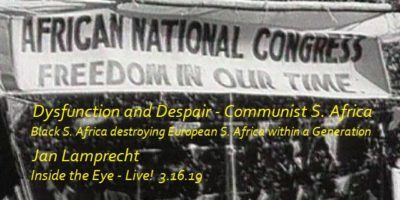 Here at Inside the Eye – Live!, we found the constant attempt to use such language tiresome and confrontational.Â For instance, Greg seems to be completely out of touch with the reality of demographic displacement within Western nations and the future problems this is going to bring to traditional majority European Americans.Â He knee jerked into calling people “xenophobic” for confronting this immigration demographic replacement strategy that is at its core being advanced by the same Jewish elements that have co-opted America to be in service of Israel. Although not exactly sure, Greg might disagree with such an assessment. He opposes the building of a wall on the border with Mexico, even as Mexico’s PresidentÂ Andres Manuel Lopez Obrador, known as AMLO, has called for what is, essentially, an invasion. The Conservative Treehouse has added that the encouraging of Mexican’s to flood into America is a long term strategic plan by AMLO’s movement and that in the long term, the strategy is to drain America of resources by shifting capital out of the United States through unbridled migration into America. That there are estimated to be some 10-11 million illegal Latin Americans in America, not to mention that before 1965, with the introduction of Jewish open immigration policies, the demographic make-up of the United States has been changed irreparably at the behest of Jewish infiltration and support of the 1965 Open Immigration Law. Of course, this is a form of invasion.Â But in Greg’s presentation, you simply can’t use the word “invasion” to communicate the dire demographic problem facing traditional European Americans.Â Indeed, Greg seemed as if he was an open border advocate, vehemently arguing against building a border wall to secure the southern US border with Mexico. Although the book “The Host and the Parasite” may be a lucid historical look at the rise of the Lobby to control American foreign policy, the truth is, the USS Liberty incident in 1967, when Jewish pilotsÂ and torpedo boats napalmed, strafed, bombed, and torpedoed the intelligence ship USS Liberty, killing some 34 naval crewman and injuring 171 was covered up at the highest of levels, or when America was goaded into war against German at a time when the nation was largely German at the core, suggests that America has been used as a Jewish battering ram for far longer than the recent arrival of the Likudnik Neocons. In fairness, Greg came on the show to discuss his book, but his insistence on defining allowable usage of political language didn’t play out so well, making for a confrontational interview. Greg was a listener requested guest.Â For fans of Greg, the interview is presented here. The show was simulcast Live Stream on Youtube.